With Halloween just a few days away, I began to remember how much candy I used to eat as a child. We would have pillowcases FULL of candy, and would stuff ourselves for days to come. Just thinking about it makes me nauseous. This year, it just so happens that my monthly dinner party fell on Halloween. While planning out what I was going to make, I knew I wanted it to be festive, and what's more festive than Twix bars?! 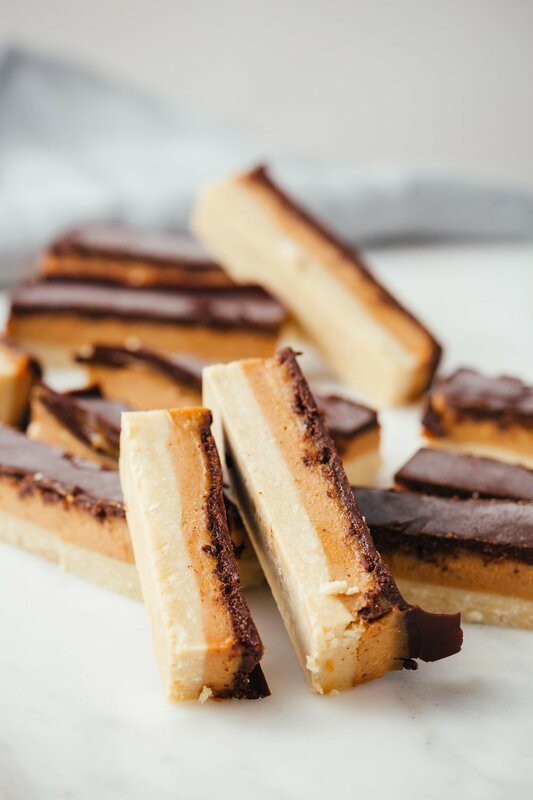 These aren't your typical Twix bars obviously, but they are a pretty darn good alternative for those of you who still want to take part in the candy stuffing activities without breaking your diet completely. Plus, they are a delicious sweet treat to keep in your freezer for those "emergency" sweet tooth situations! To start, make sure you have all of the ingredients listed, as well as a square 8x8 (or similar) pan, parchment paper, and a cookie sheet. First, combine the crust ingredients in a large mixing bowl. Mix well until you have a thick dough. You might have to use your hands. If you don't have cashew flour, feel free to substitute it to another kind of nut flour. Once the crust is well mixed, spread it out evenly into your square pan. Again, you may have to use your hands to firmly press it in. Second, put all of the caramel ingredients into a high speed blender or food processor. It is quite thick, so you'll have to be careful not to overheat the blender. Once it is well combined, pour it over your crust and spread it out evenly. Then, set it the freezer for about an hour, or until firm and not gooey. Once they are firm, remove from the freezer. Cut into thin strips and place on a parchment paper lined cookie sheet. Next, melt your chocolate chips over the stovetop. Be careful not to burn them!! Add in the coconut oil and mix well. Once combined, remove from heat or keep it on VERY low. You want it to stay liquid, but you don't want it to burn. 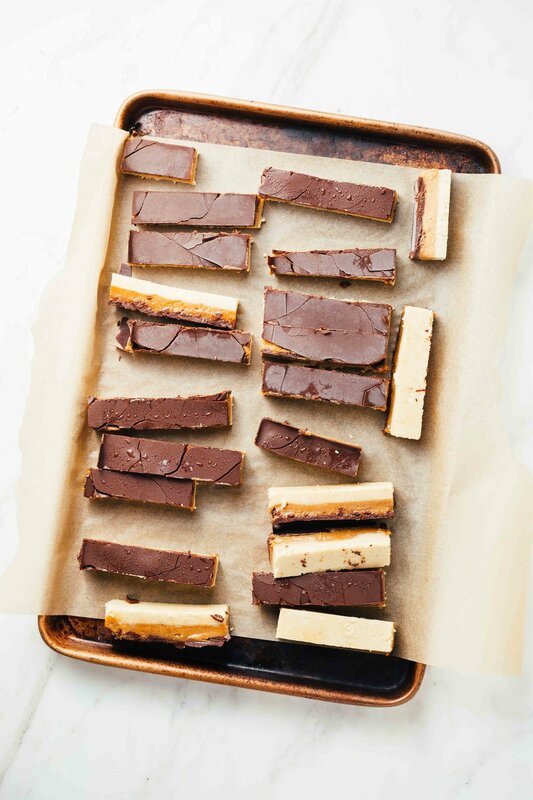 Using a spoon, drizzle the chocolate on top of the bars. You can drizzle them however you like! You can also completely dunk them in chocolate if you want them to be completely covered. Once you're done adding the chocolate, place back in the freezer until the chocolate is hard. Once hardened, feel free to store in the freezer (covered) long term, or keep them in the fridge for immediate use!